While your baby's length has possibly reached its delivery length already, he or she is continuing to pile on that body fat at around 225g per week, taking their likely weight at this stage to about 2.4kg. He or she now has fully grown fingernails and toenails and possibly even a full head of hair, although the amount of hair that babies are born with varies considerably. Babies born at this time tend to be healthy and have a good survival rate as their lungs should be fully developed and any problems that they may have with breathing can be treated quite easily. The size and shape of women at this stage in pregnancy varies a lot. No doubt you have had lots of comments from other people telling you that you are either very small, or too big, or that your bump is neat, or high or low or wide. At no other time in your life will complete strangers feel that it is OK to openly comment on your weight and shape! Grin and bear it; it happens to all pregnant women and people don't mean any offense by it. Regardless of your size, you are probably finding that you are getting less mobile now; that picking things up from the floor is more difficult and that a comfortable way to sit or stand is becoming increasingly hard to achieve. It is common to experience numbness in or around your pelvis as your baby puts pressure on your nerves. 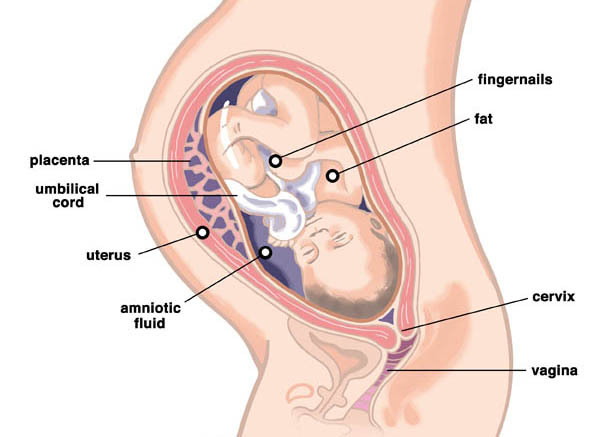 Try relaxation exercises or ask your midwife about massage that may help this. You may also find that your bladder control isn't what it used to be, and that laughter or sneezing can cause you to leak urine. This is known as stress incontinence and is caused by the increasing pressure on your bladder from the baby. Make sure that you always empty your bladder completely when you go to the bathroom, and go whenever you need to. Drinking less will not help, so ensure that you still drink at least 8 glasses of fluid every day. Continue to practice your pelvic floor exercises, and when you anticipate that you might be about to leak urine, contract these muscles as you do in your exercises. This will probably prevent any urine from escaping. Discuss with your partner how you are going to manage at home with the baby in the first few weeks. He will probably be entitled to paternity leave and statutory paternity pay. If you are lucky then his company may have a paternity policy with additional benefits so ask him to check this out with his employer. Some families will find the prospect of taking paternity leave with statutory pay only impossible at a time when you will be on a reduced income as well. A good alternative is for your partner to book paid leave instead. If your partner is planning on taking two weeks paternity leave (or holiday) consider the option, if possible, of splitting these two weeks up. This doesn't work for everybody but it could suit you. Perhaps you have a mother, sister, or close friend who will want to come and stay with you to help you for a few days when your partner is back at work. Some women find that it works very well to have their partner home for week one, to have help from family during the second week, and then to have their partner home again for the third week. It might help to reduce the shock of being home alone with baby when your partner returns to work properly.